Old Town Plaza, with San Felipe de Neri Church, Albuquerque, 1990 (?). Palace of the Governors Photo Archives HP.2007.20.1052. In a Dec. 3, 1590, journal entry, Spanish explorer Gaspar Costaño de Sosa mentioned the small bonfires his cohorts had lit to guide a scout back to camp. Luminarias, he called them, thereby casting the first stone in a 400-year-old, northern-versus-southern New Mexico debate over the little paper bags that light up our holiday nights. “They’re farolitos,” folks north of La Bajada Hill insist. “Luminarias,” everyone from Albuquerque on down says. Over the years, even linguists have disagreed. Their arguments for and against fill a fat file at the Fray Angélico Chávez History Library at the New Mexico History Museum. 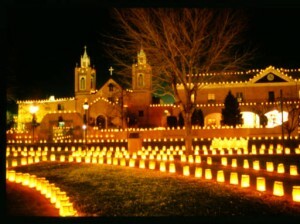 Among the certainties is this: Before the 1872 invention of flat-bottom paper bags, before the ready availability of votive candles, and before electricity and strings of “icicle lights,” New Mexicans marked the paths to their doors and the local church with small, Sosa-style bonfires on Christmas eve—symbolically lighting the way for the Holy Family. Chinese paper lanterns found their way to Santa Fe via the 18th-century Manila galleons and El Camino Real, but the paper was so fragile that outdoor use was rare. Once cheaper paper bags arrived on the Santa Fe Trail, locals discovered they could fold down the tops, anchor them with a few handfuls of sand, and set a small candle inside for a more subtle display that didn’t deplete the winter woodpile. 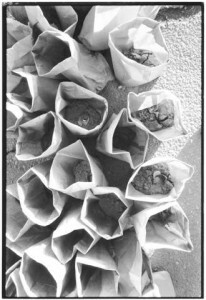 Paper bags with sand and a candle in the bottom, waiting for placement, 1980. Santa Fe New Mexican Collection, Palace of the Governors Photo Archives HP.2014.14.289. But what to call them? Some folks stuck with luminaria, “light” in Spanish. Others adopted farolito, from “farol,” the Spanish word for lantern. In the 1930s, as more people got the paper-bag bug, newspaper articles dithered, alternately calling them farolitos, linternitas, and farolillos. In 1958, the august New York Times chimed in, but said Albuquerqueans called them farolitos, further confusing the geography. Meet Fred Harvey, Mary Colter, Erna Fergusson and a bevy of Harvey Girls. Setting the Standard: The Fred Harvey Company and Its Legacy (the first major installation to join our main exhibit, Telling New Mexico), gives voice to the ways that New Mexico changed the Harvey Company—and the ways that Harvey changed New Mexico. 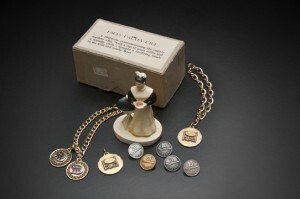 We chatted with Meredith Davidson, curator of 19th- and 20th-century collections, about how it came to be. What was your reaction on getting assigned to do this exhibition? What did you decide to focus on? The turning points in the company’s history that were directly related to New Mexico. 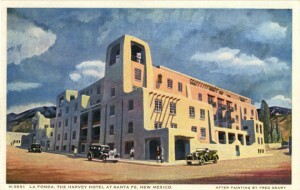 The Alvarado was an early destination hotel and the company’s western hub. La Fonda (postcard image above) shows the company’s move away from trackside-only locations. Indian Detours were the start of regional tourism. And the Harvey Girls’ genesis happened in Raton. Where did you go during your research? Kansas City, Leavenworth, California, and Arizona. I was also lucky to work closely with descendants of the Harvey family here and in Chicago, several of whom lent materials for the exhibit, including a stunning copper gong that once hung in the company’s corporate headquarters. After a winding search, I tracked down the daughter of someone known in the FredHead community for acquiring “all things Harvey.” Her father had passed away in 2010 and everyone wondered what had happened to Skip Gentry’s collection. Well, it is in about every room of his daughter’s home in North California. I spent two full days with her peeking in binders, opening boxes and moving framed pieces. I was ecstatic when she offered to lend us several of the key gems. I really can’t pick just one, but I did fall in love with a portrait of an Indian Detours Courier named Amelia McFie. I had met her family in Las Cruces and anticipated holding a place in the exhibit to tell her story, but when I saw the portrait I thought, “She’s so young and well put together!” She helps illustrate how the story of Fred Harvey is not just the large hotels and the intricate systems of high-level hospitality, but the individual lives that were touched and sometimes rerouted by opportunities offered by the company. How will this exhibit affect the Harvey story? 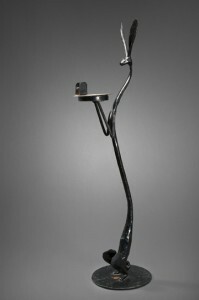 This is the first long-term exhibit dedicated to the company’s history. I hope it brings a new level of awareness to the topic and shows visitors as well as researchers that there is still so much to learn and so much more to explore—the 1915 World’s Fair in San Diego, the women in the company, the men who married Harvey Girls or worked in the establishments, the management styles that impact today’s hospitality industry, and the clever advertising promoting the Southwest. I hope this exhibit will encourage people to see the New Mexico History Museum, its library and photo archives, as resources for this history and then go out and see the remnants of this history in the Southwest.